I’ve got a treat for you this week! 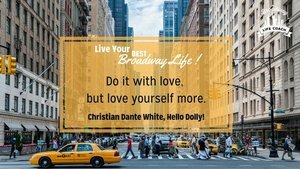 It’s Episode 13 of the #BroadwayLife interview series with the amazing Christian Dante White, from the Broadway musical Hello Dolly! Christian is the understudy for the role of Cornelius Hackl, and in this episode, he shares what it’s like to jump on stage with zero rehearsal. Plus, he shares how to stay cool when you audition in a room full of Broadway heavy hitters and how he he spends his one day off each week. You'll also hear his advice on how to live your best Broadway Life, and why he’s not just an actor but an activist, supporting and inspiring the black community within the New York theatre scene. You can follow Christian on Twitter at @dantechristian and on Instagram @christiandante. You can click here to find tickets for Hello Dolly! on Broadway.